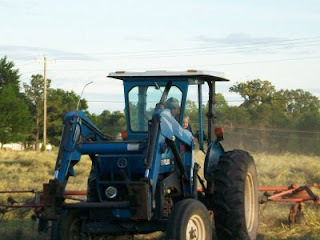 Home chickens free range eggs hay cutting milk prices Its Hay Season! Hay season here has been in full swing for over a month now. 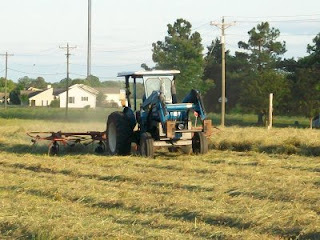 William has worked everyday between milkings cutting, raking, or baling hay in the county south of us. Last week he brought a cattle trailer of hay to the house for the sheep. The field next to the house needs to be cut as well. I'll have to check with PawPaw to see when he wants to start that. Wyatt loves anything that deals with tractors even cutting hay is fun for him. 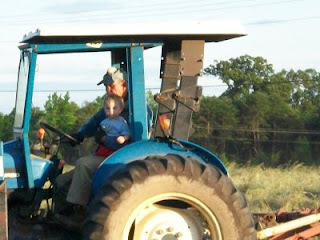 Below is a picture of Wyatt and PawPaw raking the field beside the house earlier this year. Milk prices are low and that is causing a lot of stress around here but things will look up when school starts back in September. We have lots of activities going on around here this month. Saturday William's parents and youngest sister set off for Texas and the National Guresney Convention. We also have birthday parties, anniversaries, picnics, and church socials planned. Not to mention we would like to expand our operation some by purchasing a few more yearling Suffolk ewes and laying hens. Yes, for those of you who know me I said laying hens as in chickens. William has decided a new venture might prove profitable. Free Range eggs are his big idea with the small amount of acreage at the house the option is fitting. By the way for those who don't know I am deathly afraid of birds, especially chickens. I know it sounds crazy that a country girl would be scare so something so small however I am. I will keep you all updated on how this venture turns out. Have a great 4th of July weekend!